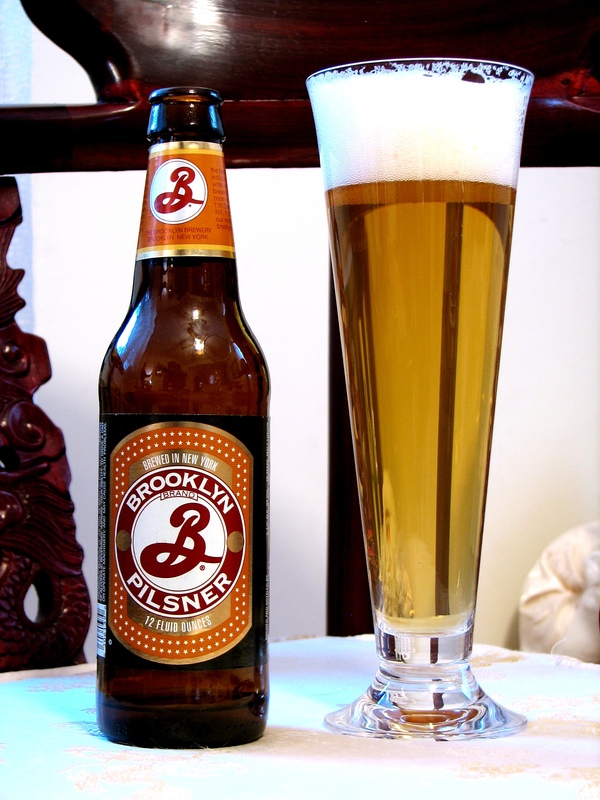 Wow…after today’s beer I will be in the home stretch with just 20 beers to go. So let us crest that hill and begin that long, fun (hopefully), and fast downhill section (mountain biking reference) towards the finish line. 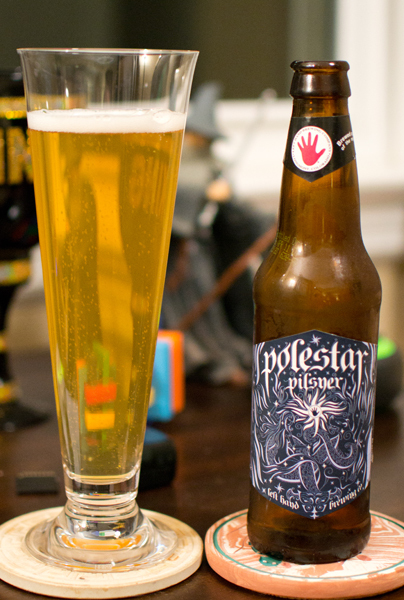 Beer #345 is Polestar Pilsner by Left Hand Brewing Company brewed in Colorado in the town of Longmont. Their version of a German Pilsner has an ABV of 5.5%. This beer had a slightly cloudy golden color to it with just a small white head. There was some really nice bubble action going in here also…it is kind of cool to stare at. I took a whiff, the nose was very bready and grassy. Mix in a bit of citrus…lemon I believe…and there you have it. It was a bit sweeter than I expected in the taste department. Malts are upfront with a very grain like and bread like flavor. Towards the back end was where I found the lemony goodness, much bigger here than in any other German Pilsner I have had. It had a bit of bitterness and was quite crisp. The body was smack dab in the middle of light and medium and it had average amounts of carbonation. This was actually quite smooth and super easy to drink. This reminded me of summertime…it was quite refreshing and quite good. I liked it quite a bit…can I say quite anymore? Oh yeah…Happy Election Day everyone!!! Get out there and vote…it is your duty as an American citizen (if you are an American citizen that is…if not ignore this) and your right. It is the week of my birthday so lets celebrate all week long with some good beer. You all have my permission (not that you need it…)…so drink up! 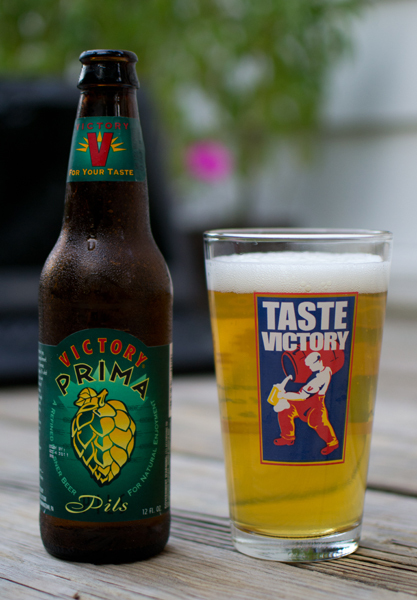 Beer #246 is Prima Pils by Victory Brewing Company. This German Pilsner is brewed in Downingtown, Pennsylvania. The ABV of this PA beer is 5.3%. The appearance of tonight’s brew was a clear pale yellow and it had a nice white head. The nose was very hoppy for a Pilsner, lots of citrus going on in here. There was also aromas of grains and grass. The lemony flavor and lemon peel bitterness hit me up front in the taste. That bitterness mellows out towards that back end with a slightly sweet bread flavor. It finishes very clean, dry, and with a nice bitter aftertaste. The mouthfeel was nice, medium bodied tipping the scales towards, ever so slightly, heavy. The carbonation was nice with a prickly feeling on the tongue. This was highly drinkable, very crisp and quite refreshing. I think this just might be my favorite Pilsner. They usually aren’t my thing but this was really, really good. I loved how the hops really took over and the malts were just playing second fiddle. I wish it was a scorcher heat wise when I was drinking this as I think this would be perfect compliment to a hot muggy summer day. I could also see this being an excellent compliment to one of my favorite styles of food, hot & spicy Thai. All in all, an excellent Pennsylvania brew! Hot enough out there for you today? And to think I just got back inside after mowing the front lawn…I feel like I lost 10 pounds from sweat alone. Lets see what is on tap for tonight…shall we? 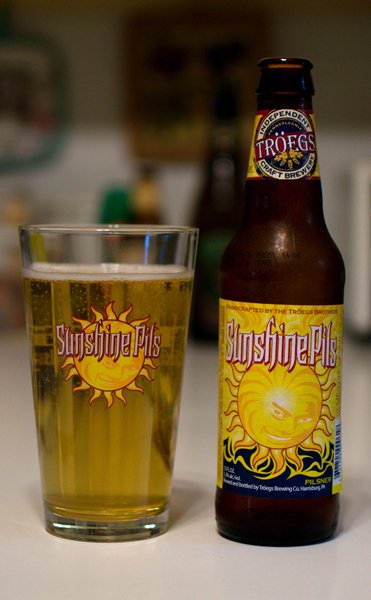 Well lookee here, I actually have a Troegs Sunshine Pilsner pint glass for the pour. The color of this brew was a clear pale yellow, maybe gold, with just the tiniest white ring of a head. Try as I might with deep sniff after deep sniff…I didn’t get anything in the nose. I swirled and agitated the beer to no end and only before I was about to give up did I get an very, very faint aroma of grass. I gave it a taste, it was grainy and sort of bread like. It had just a hint of a lemon peel like taste and bitterness near the back end. It had a light body, was kind of crisp and had a ton of carbonation. In a word…disappointing. I don’t think I will ever be a fan of Pilsners and this did nothing to change that. Now to go find me a Hopback Amber or maybe see if I have any Nugget Nectar left. Ah well…they can’t all be fit for a King. Beer #115 comes from Royersford, PA in the from of German Pilsner. 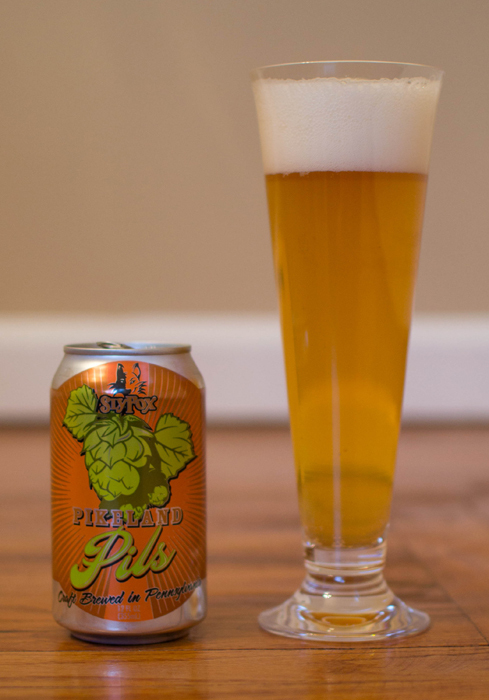 That beer is Pikeland Pils by Sly Fox Brewing Company and has an ABV of 4.9%. Into my Lenox pilsner glass went this hazy golden brew. This was another beer with a huge fluffy white head, it did dissipate fairly quickly but it left in its wake some nice lacing on the glass. The nose was very subdued and consisted of a bit of lemon, floral hops, a little bit-o-honey, and some grass. The taste followed the nose (actually more lemon than anything else) and finished off on the bitter side. It was very crisp, had a medium body, and some very fine carbonation. It was real easy to drink and was kind of refreshing. This was a middle of the road beer for me. Not horrible and nothing to write home about. A King, such as myself, deserves better. What better glass to pour this into then a pilsner and what better pilsner glass then one from Lenox, the china company, not the heating and air conditioning specialists. True to form, this pilsner had a lovely golden yellow color with a huge white head. That were hundreds of carbon dioxide bubbles rising to the top of the glass. I wish I could capture that on film, it is really cool to see. The nose was lemon and hay. Yes, hay, smelled like a farm but in a good way. Down the hatch it went and a bready malty flavor hit me first followed by the lemon and finishing crisp, bitter & dry. There was also an aftertaste that kind of hung around. Not horrible, it was just there. There was a ton of carbonation going on in with this light bodied brew. Very easy to drink was this pilsner as long as you like that style. I am not a huge pilsner fan but this is better then the Beck’s and St. Pauli Girl pilsners I have had. I wouldn’t turn it down but I also wouldn’t go out of way way to find it.